A Chinese court has rejected the appeal of a dairy boss sentenced to life in prison for her role in last year's milk scandal that sickened hundreds of thousands of babies. The official Xinhua News Agency said the People's High Court in Hebei province upheld the original verdict of Tian Wenhua. The 66-year-old was the general manager and chairwoman of the now-defunct Sanlu Group Co.
At her trial at the end of December Tian pleaded guilty to charges of producing and selling fake or substandard products after infant formula tainted with the chemical melamine was blamed in the deaths of at least six babies and the illnesses of nearly 300,000 others. She was the highest-ranking official charged in the food safety scandal, widely seen as a national disgrace that highlighted corporate and official shortcomings and corruption. During her Dec. 31 trial, Tian admitted she had known of problems with her company's products for months before informing authorities. The scandal was exposed in September. Investigations showed that middlemen who sold milk to dairy companies were watering down raw milk, then mixing in nitrogen-rich melamine to fool quality tests for protein content. Normally used to make plastics and fertilizer, melamine can cause kidney stones and kidney failure when ingested in large amounts. The discovery of melamine in dairy exports such as chocolate and yogurt triggered a slew of product recalls overseas. In January, the court also sentenced Zhang Yujun, 40, to death for running a workshop that was allegedly China's largest source of melamine, said spokesman Wang Wei. 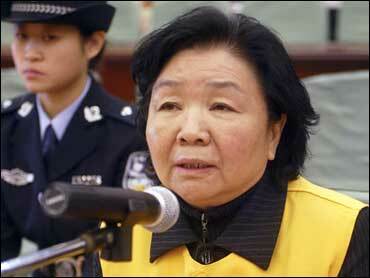 A second man, Geng Jinping, was also given the death penalty for producing and selling toxic food. Telephones at the Hebei high court were not answered Thursday evening.